We have entered the final week of our first annual Holidays, Hounds, and Hot Buys Gift Guide & Giveaway #houndsandholidays! You have until Friday to enter on any of the participating blogs – Sarcastic Dog, The Broke Dog, My Life with Dogs, A Dog Walks into a Bar, Denise’s Dog Dish and here on The Daily Pip. Ruby has the most important job of reviewing the Treats & Food Prize Package valued at $300 – you can read part one here. Halo Purely for Pets® newly launched mix ‘n mores is the ideal stocking stuffer for finicky felines and persnickety pups! These tiny morsels of quality, freeze-dried, minimally processed, whole meat provide pets with a protein boost and can be given as a treat or as a topper with daily kibble. Unlike dehydrated protein, freeze-dried doesn’t shrink or toughen so it preserves the aroma and flavor and when moistened, tastes like fresh meat. Ruby and Rosie are neither finicky or persnickety, but they absolutely love Halo mix ‘n mores® added to their breakfast and dinner. Mix n’ mores are available in chicken, beef, and salmon and turkey. Rosie went especially wild for the aromatic salmon and turkey! As with all Halo diets, supplements, and treats, mix ‘n mores® include only whole, natural ingredients and no artificial colors, preservatives, or flavors. Down Dog Snacks are grain-free, plant-based dog treats made without dairy, soy, corn, eggs or wheat. Each treat is baked by hand with all natural, real, locally sourced, human grade ingredients. They look and smell like human cookies and I was almost tempted to eat one myself! Ruby tried the Sweet Pawtato Pups and LOVED THEM. We look forward to sampling the other flavors – Banana Bliss, Peanut Butter Buddha, Peas, Love and Carrots, and Appleberry Zensations. Bravo Pet Foods are a family-owned company that offers 125 different products for dogs and cats, all made from the finest, most nutritious ingredients such as antibiotic-free poultry, responsibly harvested fish and select cuts of meat. Their slogan is “make good happen” and they firmly believe in giving pets the best so they can be at their best! Bravo is one of the foods Ruby eats on a regular basis. For the giveaway, she tried Bravo’s All Natural Turkey Recipe Treats and they drove her bonkers (in a good way)! Bravo offers a wide variety of natural canine treats, from their full-size dry-roasted and freeze-dried single protein treats to their bite-sized training treats. In addition to a multitude of delicious treats fit for a king or one really lucky dog, the Treats and Food package also includes Kong Toys, a Ruffwear Bivy Bowl, and a variety of toys by SodaPup. 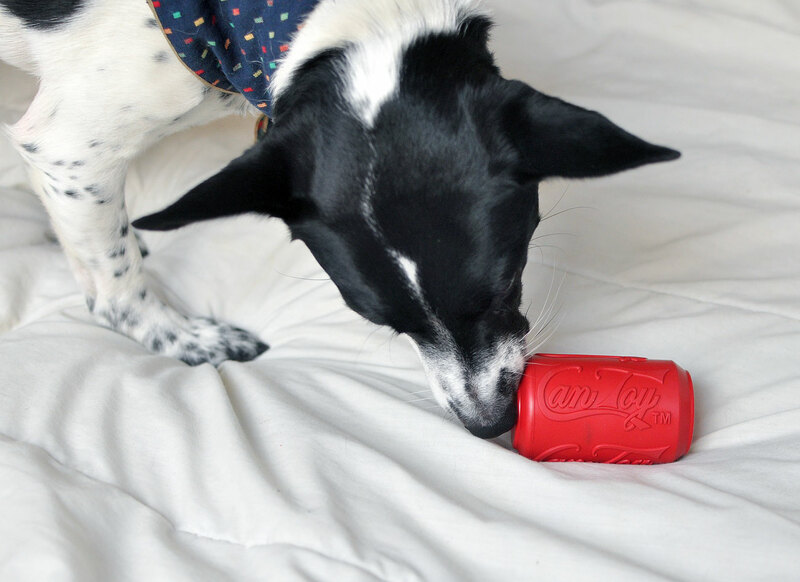 Our good friend Henry, from The Broke Dog is modeling the SodaPup Can Toy (and treat dispenser). Henry will also be reviewing the Kong Toys later this week. SodaPup toys are proudly made in the USA with sustainable, non-toxic, biodegradable rubber. The SodaPup Can Toy is the ideal product for working with crate training and separation anxiety. Fill this adorable can with peanut butter, kibble, or wet food to keep your dog relaxed and entertained for hours. Sustainability and social responsibility play a huge role in this young company’s business model and goals. They have created several programs that are designed to give back and help humane organizations and rescues across the country. You can read more about their donation programs and philanthropy here. Sounds like a great package, right? Enter on any or all of the participating blogs for multiple chances to win BIG! Winners will announced on Monday, December 13. Ruby is one lucky pup! Then again, she deserves the world, so you know … We're always overjoyed to see Rosie … and we love her bowl! Looks like great stuff. We love Bravo, and the can toy looks real interesting. Oh Ruby, isn't that fun to be able to try all those treats. They all look terrific and very healthy too. Great review too. Ruby you and Rosie have such… FINE jobs to do… BaaaaaWaaah. Yum is always a pretty popular choice!!! Those are some quality treats! I'm behind on everything, and I was afraid I wasn't going to make it back here in time to enter! But phew, I did….what an awesome giveaway!! These are such awesome prizes!!! Good luck to everyone. This has been so fun and festive! All of the products selected are fantastic, and you did such a great job reviewing them, Ruby! Ruby and Rosie are too cute for words. They deserve all the treats they get.